Writer. Reader. Lexiophile. Word nerd. However you like to describe yourself, it is your passion for words that brings you to our Retreat Center. 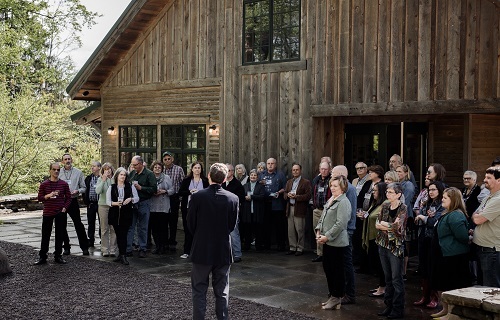 And it is at the Barn that we find our tribe–fellow lovers of language, gathered to hone our craft of using words to tell the stories of our lives. For many of you who have visited the Barn over the past few years, you’ve likely had a stop through the Word Garden. Chris Cully (you may also know her as Christine French Clark), Editor-in-Chief of Highlights for Children, had the idea for a Word Garden when the Barn was under construction. She built on her great idea by providing financial support to make the Word Garden a reality. Physical support, too: Chris and her husband Tom spent a few days digging in the Calkins Creek just below the old farmhouse to find the perfect rocks for word engraving. Last Sunday we held a dedication ceremony for the Word Garden. 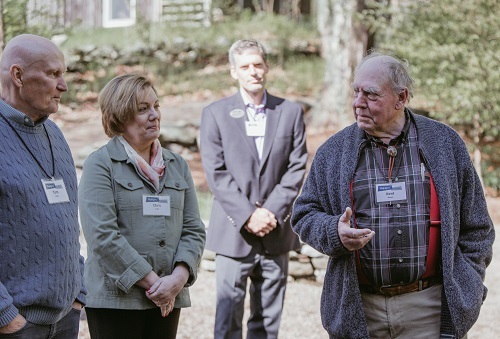 Chris and Tom were on hand to do some ribbon cutting and Kent Brown said a few words while some of our visiting writers and illustrators looked on. Tom Cully, Chris Cully, George Brown, Kent Brown. The Word Garden is a perfect addition to our inspiring setting, because our heads are full of wonderful words. Words that pack a wallop. Words that wallow. Words that whisper or wamble or waltz or warble. Soothing words. Frightening words. Quirky words. Somber words. And we all have a favorite, or two or three. 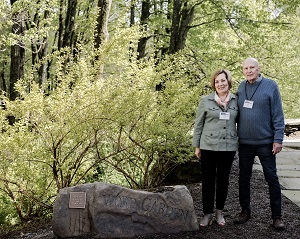 Now there’s a way to share your favorite word with others: have your word inscribed on a stone and added to the collection in the Word Garden. For a $75 contribution to the nonprofit Highlights Foundation, we will engrave your special word on a rock for all posterity. We’ll find a rock for you on the Boyds Mills property, or you can send us a special rock from your hometown. 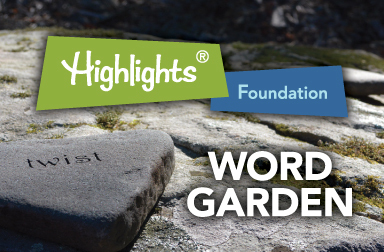 Proceeds from the Word Garden go toward supporting the Highlights Foundation Scholarship Fund. With your support, the Word Garden speaks volumes. Contribute to the Word Garden here.